1) What makes a wine age-worthy? The combination of these three will allow for a wine to still be drinkable after a few years. That does not mean though that all those 5% to 10% will actually improve with age, which takes us to our next question. 2) What makes that a wine will actually improve with age? This question is much more tricky to answer. First of all, let me qualify the term “improve” with a brief description of what we would like to see in a wine that has “improved” with age. What we are looking for here are what’s called “tertiary flavours”, which could include leather, cigar box, and forest floor flavours (among many others). These tertiary flavours have the potential to increase a wine’s complexity, thereby making it more interesting to taste than when tasted young. The reason behind my qualification of the tem “improve” though, is that not everyone appreciates these flavours, so it’s important to try a few oldies before you start cellaring to make sure you’ll appreciate those bottles still when they’ve got a few years on them. 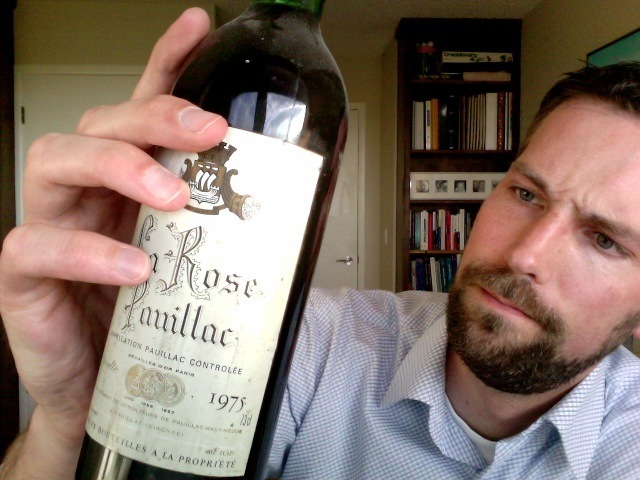 Personally, I find that nothing beats the complexity, balance, and elegance of a 10- to 20-year old Bordeaux. So with that in mind, the question then becomes which wines will develop those interesting tertiary flavours and if so, what those tertiary aromas will be like. To some extend, a greater degree of the 3 components listed above may hint at the potential for a wine to develop these flavours. Mostly though, the only way to truly find out is to let some bottles lie for a few decades, taste a bottle every few years, and see where it goes. So we only have a solid answer to this question for regions and producers that have been around long enough for us to be able to taste wines that are 10, 20, 30, 40 years old (or older). These regions include Bordeaux, Burgundy, Châteauneuf-du-Pape, Barolo, Brunello di Montalcino, and higher-end Mosel Riesling to name a few. This also means that the question is difficult to answer for regions that have only just started producing higher-end wines. As an example, certain high-end Malbecs from Argentina are showing much promise in terms of aging, but they have been around for less than two decades at the most, so only time will tell how they will develop further. 3) What wines should be aged? This last question applies to only a small (and decreasing) number of wines. There are certain wines that will simply need some time before they are ready to be drunk. You will recognize these wines by an abundance of tannins, which will make your tongue feel like a piece of leather, and a lack of fruit flavours, though still combined with high acidity. In other words, they will have an unpleasant mouthfeel and taste rather shut down. This experience will indicate that the wine needs a bit of time for the tannins to soften and the fruit flavours to open up. This wine will have softened somewhat with time, but to say that is has developed some interesting additional flavours and complexity would be a stretch. Still a great value though. Based on reviews this is “Fairly closed, but dense ripe fruit clearly there; full, concentrated, tannic wine; quite massive in style; full-bodied, with a firm, powerful palate. Long and mouthpuckering. A muscular baby.” So all of this indicates that this wine is going to need some time still to settle down. If you’re interested in putting down a few bottles and are looking for some advice, let me know!